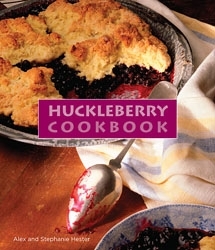 Newly expanded hardbound Huckleberry Cookbook, complete with beautiful, full-color cover. This eye-catching piece is offered in a “smaller” format, about 6″ wide and 7″ tall. 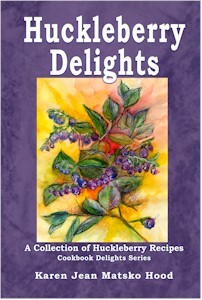 CLICK HERE TO ORDER THIS HUCKLEBERRY COOKBOOK! Here it is, the final word about the most sought-after wild fruit of the mountain west, the tangy berry that makes its domestic cousin, the blueberry, seem like bland stuff. As shy as it is succulent, the huckleberry does not happily yield to generalizations about where to find it. And little evidence makes it home from berry-picking trips to validate the purple-fingered picker’s claims about the berries that didn’t get away. So it is that a lore of huckleberries flourishes that rivals mountain stories about grizzly bears and camp cooking. This book examines the lore and the fact of the huckleberry of the West. Full attention is given to defining types, picking and preserving, proper manners in a huckleberry patch (after all, huckleberries are one of the favorite foods of bears)-all done with charming humor and sheer joy of discovery at the delights of finding, picking and eating the berry and enjoying its mountain domain. Lovingly illustrated and generously supplied with recipes collected from across the mountain country, this is the one source you’ll treasure for huckleberry knowledge and fun. 90 pages. CLICK HERE TO ORDER THE HUCKLEBERRY STORY BOOK! The Pacific Northwest yields the greatest bounty of huckleberries in the country, from which author Karen Jean Matsko Hood writes and gathers her recipes for Huckleberry Delights Cookbook. Hood has brought together carefully selected huckleberry recipes with easy-to-follow directions for beginner and accomplished cooks alike. These recipes are compiled with readily available ingredients as well as lots of poetry, history, and folklore for the reader to thoroughly enjoy time and time again. This would be a wonderful addition to any cook’s cookbook collection. A full 320 pages. NOTE; To see more huckleberry recipes, click here or on the recipe category in the posts! Imagine the luxurious ease of skipping the hike and instead picking cultivated huckleberries from your own backyard. Imagine growing a whole field of huckleberries for easy picking to sell at market. This vision is motivating Northwest researchers and growers to work out methods for growing the stubbornly wild huckleberry in backyard gardens and commercial fields. 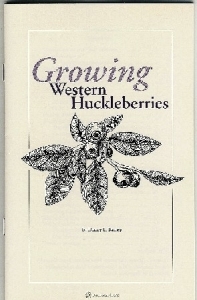 In Growing Western Huckleberries author Danny L. Barney, horticulturist and superintendent of the University of Idaho Sandpoint Research and Extension Center, shares the wisdom he has accumulated in 12 years at the forefront of work to domesticate the wild mountain huckleberry. Let his knowledge serve as a starting point in your own experiments with growing huckleberries. • Western huckleberries contain more flavor chemicals than blueberries, explaining their more intense flavor. • Although huckleberries thrive in Northwest mountains, they often die of winter cold when transplanted to lower elevations. That’s because they need an insulating layer of snow to survive cold snaps. • Western huckleberries grow best in soils rich in organic matter and low in PH. • Western huckleberries easily grow from seeds, but take 2 to 5 years to flower. I am sorry, I don’t have a list like that! Is there anyone else who knows where to buy concentrate or dried berries? I bought some things from them a while ago and they have free shipping. 91 mySQL queries in 0.380 seconds.